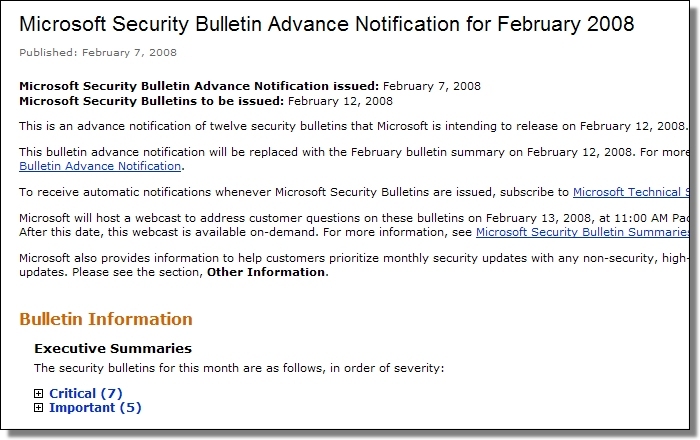 Today is the second Tuesday of the month — it's time for scheduled updates from Microsoft. Last Thursday's Security Bulletin Advance Notification included details on twelve issues, seven of which were rated as critical. Remote code executions affecting Windows (Media file formats, LSASS, Message Queuing Service, DirectShow, Macrovision Driver), Internet Explorer, VBScript, JScript and Office are involved, so keep an eye out for today's updates and get them installed. While you're updating your Microsoft software, don't forget to check your unscheduled applications as well. There have been several security updates for a number of popular applications in the last week or so. All of these applications — Apple QuickTime, Adobe Reader, Mozilla Firefox, Skype, and Sun Java JRE — have a large installed base. They're targets so make sure you have the most secure version available. Health Check was launched last month with this in mind. Note: As Anonymous wrote in this post's comments, it appears that only six critical bulletins were published today rather than seven. Also worth mentioning — Jussi's comments regarding the Linux kernel. Cheers!